It’s been a while since the last time you saw all your friends or family, so you’ve decided that a great way to bring them together is having a casual lunch in the afternoon. In the beginning it looked like a great idea but now you don’t even know where to start. Bread is an important part in our daily diet. It’s delicious and versatile, no wonder why it’s one of the most popular and oldest foods in the world. Now that the new year is here, those with weight resolutions to fulfill are starting to get on their working out shoes to shake the pounds off. A common tradition in parties and dinners is handing out party favors as a way to thank your guests for attending your event. So, if you’re searching for easy party favor for this holiday season, the Great Harvest in Hillsboro has just the thing for you! 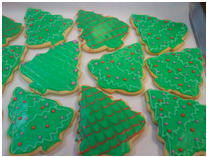 For a Cookie-Filled Holiday Season! The holiday season is one of the best times in the year! Parties, winter break and family and friends make it the merriest moments of all. Tips to Get Ready for Thanksgiving Dinner You’ll Be Thankful For! Thanksgiving is a great holiday in which we get to be with our families and be grateful for what we have. Nonetheless, it’s very stressful! Especially if you’re having guests over at your house, the pressure is on! The Irish Barmbrack Bread, A Halloween Tradition! *Update 11/06/13: Our seasonal Cinnamon Raisin Walnut bread has now changed to Stuffing Bread. Check our new menu today!